Enjoy seamless transition with two instruments. You're at a gig and you've brought both an acoustic guitar and an electric guitar, but don't want to keep plugging and unplugging your instruments. 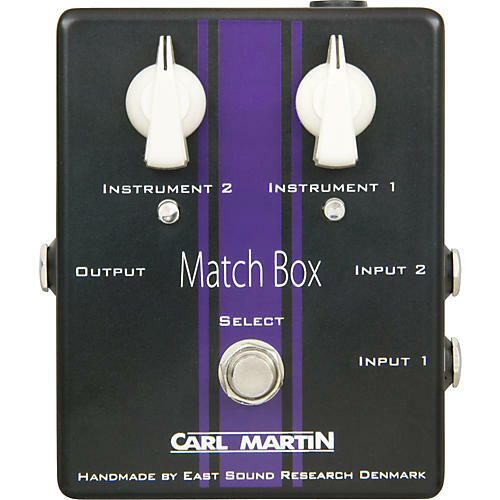 Carl Martin's Match Box line selector has got you covered. Two instruments go through this one amp selector for seamless instrument transition. With it's select switch, you can simply route either of the instruments through the amp's gain circuitry, so not only can you shift between the two instruments. The line selectors can also adjust the gain in the Carl Martin Match Box, so you don't have to adjust gain on your amp every time you change instruments. Order the Match Box now and simplify your live performance sound.